My latest ZIA is bigger and bolder too. Late last year Sue Jacobs posted her fabulous Alphabet Soup idea. 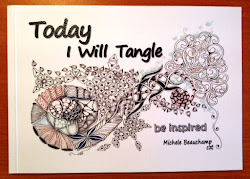 Start with a tangle beginning with the letter A and continue through to Z. Sue's lovely tangle creations are on 5 tiles. I enjoyed tangling on the large watercolour paper so I decided to do the whole alphabet in one, with a touch of pumpkin colour to make a big hearty pot of Alphabet Soup. To help with the recipe I reached for Linda Farmer's wonderful Tangle Patterns.com Tangle Guide. I hope you find it tasty! Thanks Sue, Linda and Zentangle. It's a delicious work of art! Lovely! striking, lovely, intricate as ever!! enjoy seeing what u=you do each time. Wow, this is a fantastic ZIA! Love your use of color, really fun to see all the different zentangles together in one artwork, you should be very happy with the way this came out! Great job! Great idea, Shelly! Lovely piece! I wonder how many pieces you could do with the alphabet since there are so many tangled out there now. That is one tasty soup, Shelly!!! Yum Yum! I'm inspired! 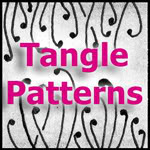 It's a delicious blend of delectable tangles from your Zentangle pantry. The sprinkling of spices is just enough to emphasize the tangles and occasional negative space. Lovely, Shelly.